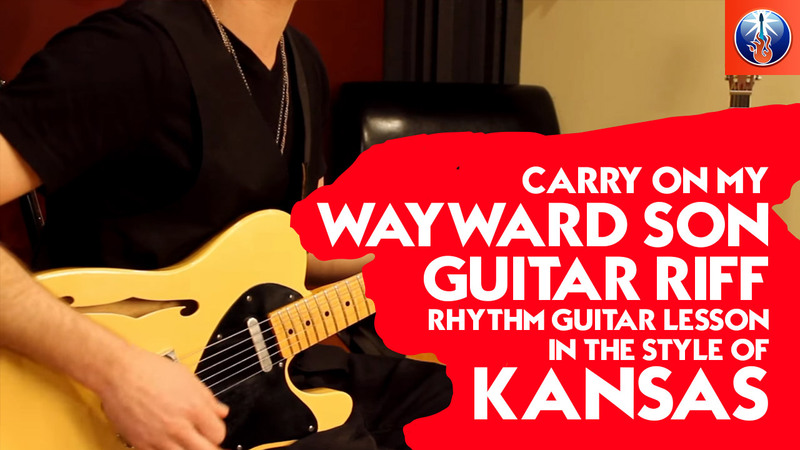 In this Guitar Control video lesson, Instructor John Maclennan is going to show you how to play Carry On My Wayward Son by Kansas! This riff is so cool! It is fun and pretty easy to play and has some pretty cool techniques in there. This is a great song for a beginner looking to try some lead guitar techniques and a great some for any player that just wants a fun, catchy awesome riff to play! John is going to show you some great rock and roll, classic rock and roll licks in the key of A minor using the pentatonic scale. Step one to learning how to play Carry On My Wayward Son is breaking down this awesome riff! Starting with your 3rd finger on the 5th fret 6th string, pick this note and then go down a whole step taking us to the 3rd fret 6th string with your pointer finger, and the right back to the 6th string 5th fret with your ring finger. Then drop your first finger to the 5th string 3rd fret and pick this note. You can probably already tell how cool and powerful this riff is with just these first few notes! Then we are going to repeat almost all of that, just changing the last note to a different one. So back to the 6th string 5th fret with your ring finger, to the 6th string 3rd fret with your pointer finger, back to the 6th string 5th fret with your ring finger. And here is where we change! Now you just drop your ring finger down a string and pick the 5th string 5th fret once. Playing this entire riff so far with just our first and third fingers. If you are enjoying learning this classic riff, make sure to also check out our other lesson on how to play Don’t Fear the Reaper by Blue Oyster Cult for another stand out riff to add to your repertoire. The second half of this riff starts with a slide. A slide is when we put pressure down on a note, we pick once and then move your finger across the string, still putting pressure down until we get to the next desired note. So you do not lift your finger till you get to the note you want. If you lift your finger you loose the sustain. So slide from the 5th to 7th frets on the 5th string with your ring finger. Then drop your first finger down to the 4th string 5th fret. Then you are going to work your way back down starting with your ring finger on the 5th string 7th fret, and actually all three of these notes we are using to walk down are on the 5th string, so first 7th fret with your ring finger, then you are going to switch to using your pointer for the next two notes, both still on the 5th string, go ahead and play the 5th fret 5th string, to the 3rd fret 5th string. Again the first note of the walk down you used your ring finger and then for the last two notes you used your pointer finger. Then end this riff by using your pinky to hold down the 5th string 5th fret, the use your pointer finger to grab the 6th string 3rd fret, then go back to your pinky holding down the 5th string 5th fret, and then the very last note for this riff, grab the 2nd fret 6th string. Then repeat both parts together starting from the beginning! I hope you enjoyed learning how to play Carry On My Wayward Son on guitar. What a fun song. This riff is so cool and it is hard to not feel cool playing it! It’s super powerful and catchy, and Kansas just did an amazing job with this one. This riff is the kind of riff every guitarist wishes they wrote and everyone wants to learn. Remember when learning from the greats, these are not only lessons that show you how to play a riff but use them as lessons on how to write riffs. What do these stand out bands and guitarist do that’s different from the norm? Try to incorporate some of the cool touches and flare that they add to their riffs to your own, and of course, as always, have fun! Cool thanks for lesson and tab.